Get rid of duckweed and other aquatic weeds. Fluridone is intended for treating the entirety of a contained water body. Spritflo® Fluridone herbicide controls duckweed and nearly all submerged pond weed varieties, except algae. Spritflo® Fluridone herbicide is a great product for duckweed control. Combine with an algaecide such as Mizzen® for algae control. Spritflo® Fluridone Herbicide is equivalent to, and a direct substitute for Alligare Fluridone and Sonar AS Liquid, containing the same 41.7% active ingredient, for Less! Spritflo® Fluridone herbicide is a proven and popular active ingredient for controlling aquatic weeds in fresh water ponds. 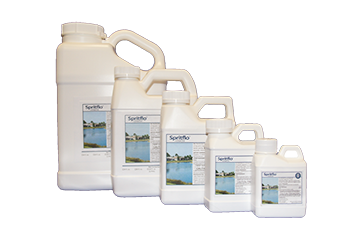 Spritflo® Fluridone herbicide effectively controls a wide range of floating and submersed aquatic vegetation, including duckweed. Do not irrigate established turf/plants out of treated pond for 30 days see label in resources. Controls and prevents: Hydrilla, Bladderwort, Watermilfoil, Naiad, Elodea, Water-lily, Pondweed, Coontail and Duckweed. See our Video Demonstration to view how easy it is to apply Fluridone herbicide. Saw results in only a few days and after 2 weeks, almost all the duckweed is gone. My one acre pond was covered in duckweed and I used Fluridone to treat it. The duck weed is now gone and my pond looks fabulous! Thanks Lake Restoration!